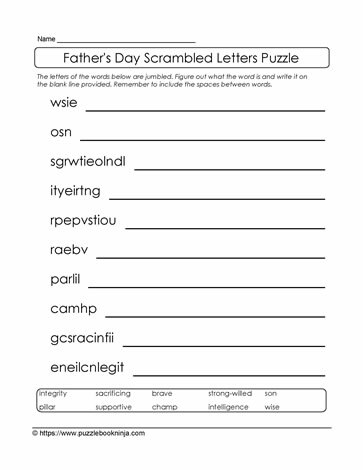 This jumbled letters puzzle for Father's Day is sure to be a hit with family and in classrooms and home schooling getting ready for the big day in June. Students in elementary classrooms and home schooling environments can use these puzzles to jump start a unit about Father's Day or make it part of the literacy center, while engaging the brain and making learning fun at the same time. Scrambled letters puzzles help support visual acuity and consolidate spelling and vocabulary building.